Coconut Jelly is a popular dessert from Thailand. It is very easy to make at home. All you need are fresh young coconut, agar-agar powder, and sugar. This jelly is slightly firm, but you can adjust the amount of agar-agar powder for a softer texture. Do try this refreshing and yummy dessert. With a cleaver, open the coconut and reserve the juice. Top up the water to reach 500ml of liquid. Remove the coconut flesh and set aside. Then combine the coconut liquid, agar-agar powder, and sugar. Stir well until the agar-agar powder dissolve. Place on the stove and add pandanus leaf. Bring it to a boil, reduce the heat to low, and cook until the sugar and agar-agar dissolve. Leave them to cool slightly. 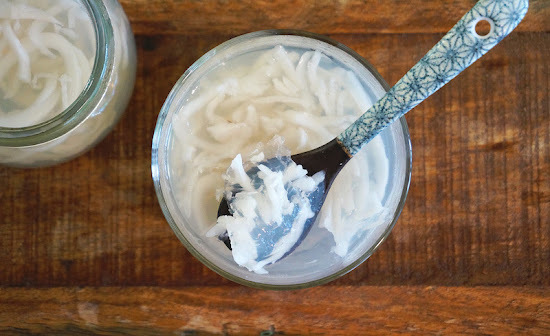 Fill the coconut flesh into small jars or mould and strain the agar-agar liquid. Let it cool at room temperature and cover with plastic wrap. Refrigerate until they are firm and cold. Serve chilled. Note* Recipe adapted from Elinluv's Sweet Delights with minor changes. Hi there! I came across your site while looking for recipes with agar. Am a newbie vegan. Love your site! When you have time or are interested, could you put in a printer friendly option for your site pages? I'm not always on the net. I use it at school or at the library only. Would be great to show the recipes to my mom along with the pictures on my laptop. So the noodle looking pieces are the coconut? How did you get the coconut out, it usually takes me forever to get the meat out in chunks. Also what are Pandanus leaves and what type of store could I find these in? I love coconut and this sounds great. @Alicia P: Yes, those are the flesh from young coconut. Just use a spoon to scoop the flesh/meat out. Pandanus leaf has an earthy, refreshing fragrance taste that enriches many sweet desserts. They are usually available at Asian grocers.